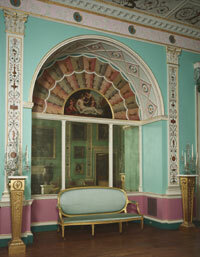 A drawing room was not just for drawing. During the late Georgian period and beyond, when socializing was made easier with more efficient transportation, great houses utilized their spaces in new and creative ways to enhance the party experience. And you thought your living room was just wasted space. In Notorious Match, the Lansdowne Ball featured dancing and gaming. After arriving, Diana found herself at a game of faro that was set up in the famous Adam drawing room. Her luck at the game was indifferent at best. The last time she played she lost her mother’s pearls. To her disappointment, the banker refused to accept her voucher to play. So she staked something else that Lord Harcourt would be unable to resist. Irresponsible? Perhaps. Did she do it to provoke Griffin? For once, no. Unknown to anyone, she was desperate to extinguish a little girl’s anguish, enough to pledge something very dear. Out of the corner of her eye, Diana saw Griffin fold his arms. She suspected he was trying very hard to look unconcerned. Serves him right for playing governess. Griffin knew she did not like any hand on her bridle—whether her uncle’s or Vivien’s. But least of all his. The emeralds were so fine they made the diamond setting holding them look insipid. They were the dowry of some long ago heiress who brought them to Northam when she married its earl, one of many sets of jewels Diana had in her strongbox at herLondontown house. Harcourt laid them beside bank notes, property titles and a variety of coins wagered by other players. Seeing them in that light gave Diana pause. They, like anything else belonging to Northam, were her responsibility. “Deal the cards,” she commanded nevertheless, determined not to reveal her fear of losing them. The drawing room used for faro and baccarat games that evening was the famous Back Drawing Room, designed by Robert Adam in about 1763 along with the original plan commissioned by the 3rd Earl of Bute. It is considered the most elaborately decorated of the entire suite of reception rooms in Lansdowne House before its mutilation in 1930. Its primary feature is a great bay that was originally designed to contain Lord Bute’s elaborate mechanical organ. This entry was posted in Notorious Match, Regency, Uncategorized and tagged Angelica Kauffman, Cipriani, Earl of Bute, Earl of Shelburne, Fiske Kimball, Lansdowne House, Philadelphia Museum of Art, Rear drawing room, Robert Adam, Zucchi by Angelyn. Bookmark the permalink. Interesting about the drawing room. I love these little bits of history, but I loved the excerpt from Notorious Match. Hmm. Added it to my tbr list. Very gratifying to hear that–I’ve got my fingers crossed we’ll find an agent. What a wonderful post. I loved the pictures and the excerpt. 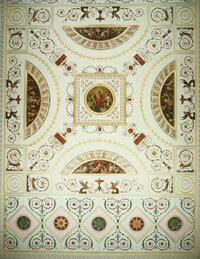 My thanks–the Philadelphia Museum of Art has many more pictures of the detailed artwork this marvelous room has. This is my favorite excerpt from Notorious Match so far. How intriguing! I’m so glad the museum saved the room so it wasn’t lost forever. Oh–thank you. Part of the opening scene. The drawing room is lovely. Can’t wait for Diana’s story to be published.